His Holiness Patriarch Mor Ignatius Aphrem II consecrated the church of Mor Shmouni in Ghala – Muscat, Oman. 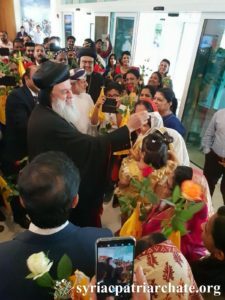 His Holiness was assisted by His Beatitude Mor Baselios Thomas I, Catholicos of India, and their Eminences: Mor Ireneos Paulose, Patriarchal Vicar of Oman and Metropolitan of Kozhikkod Diocese, Mor Clemis Daniel Kourieh, Metropolitan of Beirut, Mor Barthelmaus Nathanael Youssef, Patriarchal Vicar in the United Arab Emirates and the Arabian Gulf Countries, Mor Gregorios Joseph, Metropolitan of Cochin Diocese and Secretary of the Regional Episcopal Synod in India, Mor Melethios Yuhanon, Metropolitan of Thumpamon Diocese and Patriarchal Vicar for Australia, Mor Theodosios Mathews Metropolitan of Kollam Diocese, Mor Chrysostomos Markose, Metropolitan of Evangelical Association of the East, Mor Osthatheos Issac Metropolitan of Mylapore Diocese and Patriarchal Vicar for UAE, and Mor Timotheos Matthew, Patriarchal Secretary for Indian Affairs, in the presence of the clergy and parishioners. His Holiness then celebrated the Holy Qurobo in the newly consecrated church. 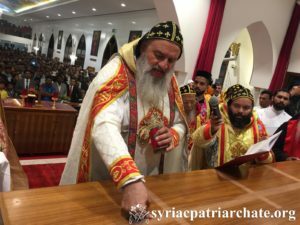 In his sermon, His Holiness expressed his happiness to gather with his spiritual children from our Syriac Indian Church in Oman, especially for the consecration of the new church which is the House of God. His Holiness thanked His Majesty Sultan Qaboos, the government and people of the Sultanate of Oman, for facilitating the construction work and showing all love to our church in Oman. He then explained that the consecration of this house of worship is what makes it a holy place where the faithful can gather in the name of the Lord, praise Him and offer the Holy Qurobo, thus be sanctified themselves. At the end, His Holiness thanked all those who helped bringing the building of the church to completion. 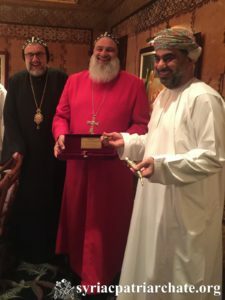 His Holiness Patriarch Mor Ignatius Aphrem II met with His Excellency Dr. Salem Ben Nasser Al-Ismaily, Chairman and Chief Executive Officer of the Sultanate of Oman Public Authority for Investment Promotion and Export Development, at the Opera House in Muscat. 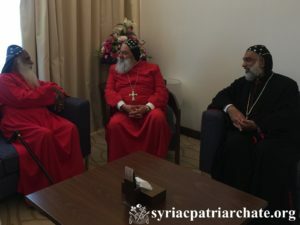 During their meeting, His Holiness and His Excellency had a cultural discussion in which they spoke about the history of religions, especially that of our Syriac Orthodox Church and its presence in Oman. 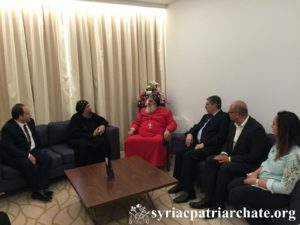 The meeting was attended by His Eminence Mor Clemis Daniel Kourieh, Metropolitan of Beirut, and Very Rev. Raban Joseph Bali, Patriarchal Secretary and Media Office Director. His Holiness and His Excellency exchanged tokens of respect. His Holiness Patriarch Mor Ignatius Aphrem II celebrated the Holy Qurobo at St. Mary Church in Ruwi – Oman. He was assisted by their Eminences: Mor Gregorios Joseph, Metropolitan of Cochin Diocese and Secretary of the Regional Episcopal Synod in India, and Mor Ireneos Paulose, Patriarchal Vicar of Oman and Metropolitan of Kozhikkod Diocese. Their Eminences: Mor Clemis Daniel Kourieh, Metropolitan of Beirut, Mor Mor Barthelmaus Nathanael Youssef, Patriarchal Vicar in the United Arab Emirates and the Arabian Gulf Countries, Mor Melethios Yuhanon, Metropolitan of Thumpamon Diocese and Patriarchal Vicar for Australia, Mor Theodosios Mathews Metropolitan of Kollam Diocese, Mor Chrysostomos Markose, Metropolitan of Evangelical Association of the East, Mor Osthatheos Issac Metropolitan of Mylapore Diocese and Patriarchal Vicar for UAE, and Mor Timotheos Matthew, Patriarchal Secretary for Indian Affairs, attended the Qurobo. In his sermon, His Holiness greeted his spiritual children and expressed his great joy to among them. He spoke about the ascension of our Lord Jesus, which our Church in India is celebrating today following the Gregorian calendar. 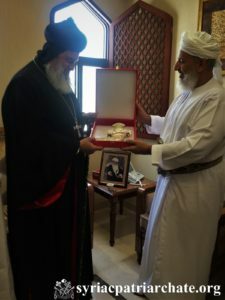 His Holiness Patriarch Mor Ignatius Aphrem II received a delegation from the sister Coptic Orthodox Church in Muscat, at his residence in Muscat, Oman. The delegation was led by Fr Surial Anba Bishoy, Priest of the Coptic Orthodox Church in Muscat. The delegation expressed their great honor to meet His Holiness in Oman and receive his blessings. They also wished him a successful apostolic visit. His Holiness Patriarch Mor Ignatius Aphrem II received His Grace Joseph Mar Thoma, Metropolitan of the Mar Thoma Syrian church, at his residence in Muscat, Oman. His Grace welcomed His Holiness in the Sultanate of Oman and wished him a successful visit. During the meeting, His Holiness discussed with His Grace various church issues. The meeting was attended by their Eminences: Mor Gregorios Joseph, Metropolitan of Cochin Diocese and Secretary of the Regional Episcopal Synod in India, and Mor Timotheos Matthew, Patriarchal Secretary for Indian Affairs, as well as Very Rev. Raban Joseph Bali, Patriarchal Secretary and Media Office Director. His Grace was accompanied by Fr. Shijo Abtlraham Zacharia, the secretary to the Metropolitan, and Fr. Titus Thomas Vicar of St. Paul’s Church of the Mar Thoma Church in Muscat. His Royal Highness welcomed His Holiness in the Sultanate of Oman, conveying to him the greetings of His Majesty the Sultan and his love and respect to all Christians and to our Church in Oman. His Holiness thanked His Royal Highness for his warm welcome, and prayed for the continuous success and good health of His Majesty the Sultan as well as His Royal Highness Sayyid Haitham, showing is gratefulness to the atmosphere of tolerance found in Oman. During their meeting, they discussed issues related to the current crisis in Syria, and assured that a peaceful resolution should be reached. His Holiness spoke about the history of our Syriac Church in the region, and pointed out that we had churches in different places in Oman, and about the present of our Church and people there. He also spoke about the painful history of our church and the continuous persecutions she had suffered, especially during Sayfo. 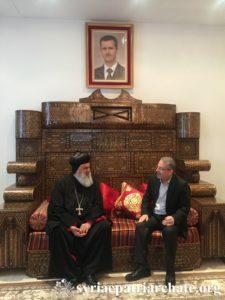 He also pointed out to the abduction of their Eminences Archbishops of Aleppo, Mor Gregorius Youhanna Ibrahim, and Boulos Yaziji, and asked the help of His Royal Highness to bring their case to a good end, noting the great role of His Royal Highness in the release of Fr. Tom in Yemen. His Royal Highness emphasized the importance of reaching peace and stability in the Middle East, and assured that the history of the Sultanate of Oman goes back to hundreds of years of religious freedom and is open to all religions. He also showed his readiness to help in the case of the two abducted archbishops, and noted the respect of our faithful there to the Sultanate. 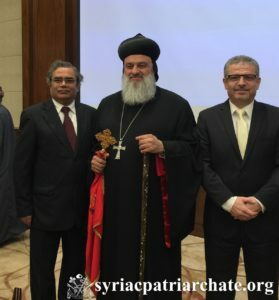 The meeting was attended by their Eminences: Mor Gregorios Joseph, Metropolitan of Cochin Diocese and Secretary of the Regional Episcopal Synod in India, Mor Clemis Daniel Kourieh, Metropolitan of Beirut, and Mor Timotheos Matthew, Patriarchal Secretary for Indian Affairs, as well as Very Rev. Raban Joseph Bali, Patriarchal Secretary and Media Office Director, and Commander Thomas Alexander. His Holiness Patriarch Mor Ignatius Aphrem II attended an official reception on his honor in Muscat. 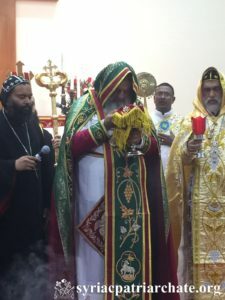 Their Eminences: Mor Gregorios Joseph, Metropolitan of Cochin Diocese and Secretary of the Regional Episcopal Synod in India, Mor Ireneos Paulose, Patriarchal Vicar of Oman and Metropolitan of Kozhikkod Diocese, Mor Melethios Yuhanon, Metropolitan of Thumpamon Diocese and Patriarchal Vicar for Australia, Mor Theodosios Mathews Metropolitan of Kollam Diocese, Mor Chrysostomos Markose, Metropolitan of Evangelical Association of the East, Mor Osthatheos Issac Metropolitan of Mylapore Diocese and Patriarchal Vicar for UAE, and Metropolitan Joseph Mar Thoma, Metropolitan of Mar Thoma Church. Sheikh Noman Bin Hareth Al-Amiri, Sheikh of Al Seeb city, representing the government of Oman, Sheikh Ahmed, Deputy Minister for Religious Affairs at the Ministry of Endowments in the Sultanate of Oman, were also present. Their Excellencies Mr. Andramani Pande, Ambassador of India, and Mr. Bassam Seifeddin Al-Khatib, Ambassador of Syria, attended the Official Reception. In his word, His Holiness expressed his great joy to be among the faithful of our church in Oman; he spoke about their role in building the society, and collaborating with the people of Oman. He also thanked His Majesty Sultan Qaboos bin Said Al Said, Sultan of Oman, as well as the government of Oman, for their support to Christians, and the love they are showing to our people there. His Holiness Patriarch Mor Ignatius Aphrem II was received by a crowd of faithful of our Church in Muscat at his residence. Leading the crowd were their Eminences: Mor Gregorios Joseph, Metropolitan of Kochi Diocese and Secretary of the Regional Episcopal synod in India, Mor Ireneos Paulose, Patriarchal Vicar of Oman and Metropolitan of Kozhikkod Diocese, Mor Melethios Yuhanon, Metropolitan of Thumpamon Diocese and Patriarchal Vicar for Australia, Mor Theodosios Mathews Metropolitan of Kollam Diocese, Mor chrysostomos Markose, Metropolitan of Evangelical Association of the East, Mor Osthatheos Issac Metropolitan of Mylapore Diocese and Patriarchal Vicar for UAE. Sheikh Noman Bin Hareth Al-Amiri, Sheikh of Al Seeb city, representing the government of Oman, Sheikh Ahmed, Deputy Minister for Religious Affairs at the Ministry of Endowments in the Sultanate of Oman, were also present. His Holiness was accompanied by their Eminences Mor Clemis Daniel Kourieh, Metropolitan of Beirut, and Mor Timotheos Matthew, Patriarchal Secretary for Indian Affairs, as well as Very Rev. Raban Joseph Bali, Patriarchal Secretary and Media Office Director. His Holiness thanked the faithful of our church for their overwhelming love and expressed his great joy to be among them.